Microsoft rules the enterprise technology market. Email, operating systems, office productivity tools (think Word and Office), and now the intranet, with Microsoft SharePoint. They don’t just want your business, they want to run your business, and own the digital workplace. “With Office 365, Microsoft currently offers the most powerful communication and collaboration suite on the market. And the latest announcements from the Microsoft Ignite conference across the main workloads like SharePoint, Teams and Powell Apps prove that they continue to move forward fast in order to stay ahead of the game,” says Antoine Faisandier, CEO of Powell Software, a Digital Workplace software that extends and enhances the Office 365 capabilities. It’s important to note that SharePoint is still a technology. It doesn’t include all of the people, process and planning that is required to make any intranet technology work. Intranet technology will fail without careful planning, process and committed people. Most of the key ingredients of a successful intranet in the digital workplace are based on people, and process; technology is merely an enabler. In other words, for those hoping SharePoint will magically address all of your governance and content concerns, keep hoping. Hope is no solution; no solution by itself plugs the holes in a leaky or non-existent governance model (this is also true content quality). To ensure SharePoint works effectively, the intranet requires a thorough plan, a sound governance model, and a rigorous content management plan. All of which are independent of the technology. However, there are many, many problems that SharePoint can solve, if implemented correctly, and it may in fact be the best, true all-in-one digital workplace solution for a .NET enterprise. The new SharePoint 2019 builds on many of the features that were slowly rolled-out in SharePoint Online (in the cloud, which is not a standalone service, but comes with Office 365). Microsoft’s clear focus is hybrid computing (a hybrid of on-premises, and cloud computing) with a minor in mobile access. SharePoint’s hybrid model is part of the planned evolution where the on-premises version is extended by cloud-only features, with a more dramatic shift from on-premises to cloud happening over time. For example, employees can use document libraries on-premises in SharePoint and also with Microsoft’s OneDrive (cloud storage) to manage files across multiple devices. 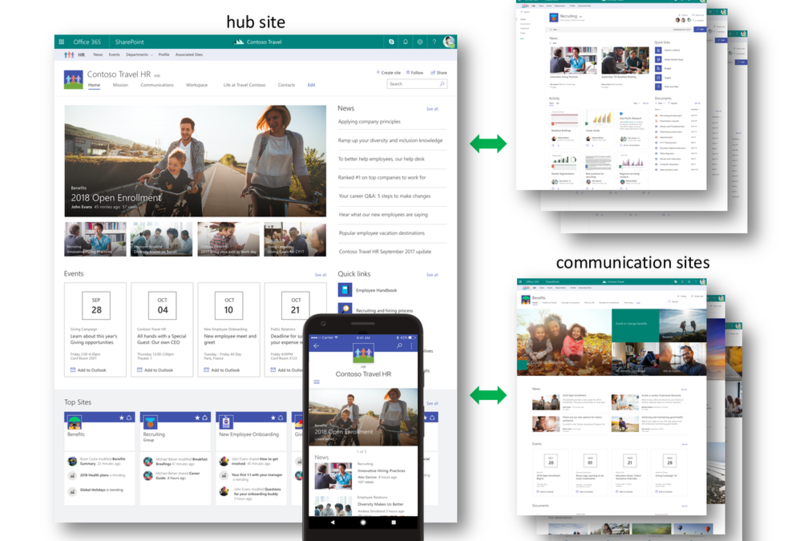 A hybrid SharePoint environment enables enterprise users to simultaneously search for content in SharePoint on-premises and SharePoint Online. SharePoint’s social collaboration tools have also taken a step forward. Delve, first launched in 2016, represents a significant improvement to the traditional ‘social networking’ approach to collaboration. In the past, SharePoint profiles were contained in My Sites, which essentially was a standalone intranet collection, separate from the main SharePoint intranet. Microsoft Teams, and the latest integration with Skype for Business, hopes to take the wind out of Slack’s sails. My Sites has been supplanted by My Profile, and is powered by Delve, that delivers the most relevant and recent content (based on profile and user connections to other employees) in a card-based activity stream. The mobile experience has also improved significantly, which in the past was less than pathetic (no mobile app, no responsive design). Now a dedicated mobile app, and a Responsive User Interface Package, designed to adapt SharePoint views to your screen size so you can work on any device. “Dubbed the “Modern SharePoint” both on SharePoint and on Office 365, it comes responsive (allowing access from any device including mobile phones) out of the box and much easier to use for our End Users,” says Carl O’Connor, Product Manager, with SharePoint content migration experts, Sharegate. SharePoint is now evolving at Internet speed. New releases of SharePoint happen every three years or so, but in the cloud, in Office 365, changes and additional functionality will be released every few months. Web content is also a notable weakness. In its review of 19 top web content management (WCM) platforms, applied to five major use case scenarios, Gartner ranked SharePoint 2013 as dead last in each category. Scoring an average of 1.85 out of 5. Since this review, Gartner has shuttled SharePoint out of the category altogether. The user experience also leaves little to be desired. Out of the box it is cumbersome, wracked with basic usability issues, with a frustratingly alien information architecture. The future is cloud computing, and mobile computing via the cloud; Microsoft has bet the farm on this, hence Office 365. As such, Redmond is making regular changes and upgrades to Office 365, every month. Not surprisingly, the next big release, SharePoint 2019 is coming in a few weeks, for the on-premises version. But most of the features in SharePoint 2019 are already available in the Cloud. Microsoft wants you to move to the cloud. Microsoft is trying to improve and innovate, as represented in their hybrid strategy and new innovations in social computing and search. Toby Ward is the President of Prescient Digital Media, an intranet and digital workplace consulting firm that helps Fortune 500 companies (and others) plan, design and build enterprise intranets and digital workplaces. He is the chair of the annual Digital Workplace & Intranet Global Forum conference in NYC.